installing doors throughout the county since 2007. Unlike many online suppliers, you can be assured that Invicta Doors Limited is an established local business with a high level of expertise and a focus on customer service. We are based in Kent so are able to provide a prompt and efficient service to our customers. We have hundreds of satisfied customers who have benefited from our straightforward ordering process. You only have to deal with one person from discussing your order options through to the installation of your new uPVC Door, Rockdoor Composite Door or GRP Composite Door. This enables us to keep costs down (no salesman’s commission or survey fees) and give a personal service throughout with great quality control. These benefits are passed on to you, the customer, ensuring excellent value for money and satisfaction. There is no deposit to pay - we only ask for payment once the new door is installed to your satisfaction. Please take the time to look around our unique one-stop door shop. Where else will you find such a wide selection of styles and designs? Where else will you see fully inclusive FITTED prices online? 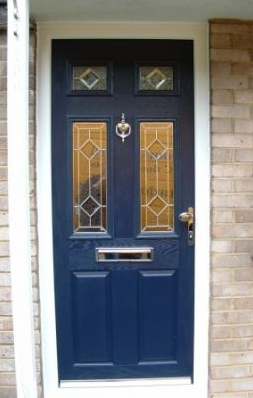 There is no catch, no hassle - just top quality doors at sensible prices, expertly fitted! Choose the style of door you like from our Products, click on the door and you will see the full range with fully inclusive FITTED prices. The price INCLUDES letter plates, knockers and lever handles as shown in the relevant picture. VAT has also been included. Phone your local area number or email sales@invictadoors.com We will arrange to visit you (evenings ok) for a free site survey. If you are ready to place an order we'll book a fitting date with you (usually within 10 days). In most cases no deposit is required. Your fitter will return to fit your new door and dispose of your old door & frame etc. You pay only when the work is complete and to your satisfaction. We provide a full invoice, 10 year guarantee & a CERTASS certificate will be sent to you.